Home Hair Care Hair Colour Cruset Platinum Developer Cream 60 and 1,000 ml. ครูเซ็ท แพลทตินั่ม ดีเวลลอปเปอร์ ครีม 60/1,000 มล. Cruset Platinum Developer Cream 60/1,000 ml. 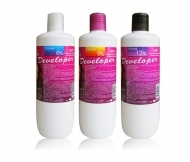 A mixing agent for Hair Colouring Cream or Bleaching powder, providing prominent colour. Blended with soft and sweet mass of the floral flowers scent. For Cruset Platinum Developer Cream 3%, able to develop hair for enhancing brilliant colour hair or bleaching your body hair.